Want to manage details – such as property access information, when confirming appointments on your listings? Listing agents can easily review and update their listing’s access details (access codes, alarm disarm codes, etc.) 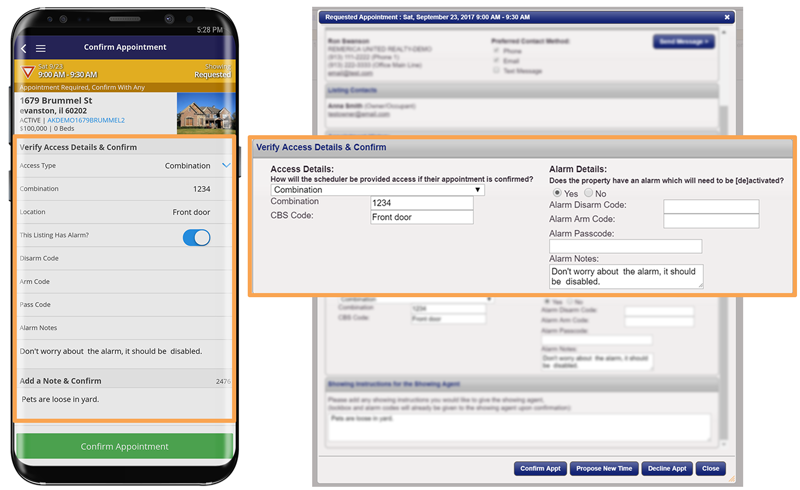 and showing instructions when confirming appointments, ensuring showing agents have the latest details for their upcoming showings. A good way to eliminate any last minute showing frustrations! This can be done in either the ShowingTime desktop version or the mobile app by going to the “Showings” tab or section and choosing the option “On My Listings”. From there, a specific appointment can be edited and the showing instructions can be modified before confirming the request. NOTE: ShowingTime receives automatic updates every 15 minutes from the MLS, so it won’t take long for showing agents to see any updates the listing agent makes. Click here for a screen shot example.